I am known for throwing overly ambitious dinner parties. Sometimes they work out really well—usually when my guests are smart and bring lots of beer and a hefty salad. Sometimes they do not, and I’m pretty sure everyone ends up going through McDonald’s drive-thru when they leave my house. My problem is that my imagination often outpaces my organization skills, which, I'll be honest, were never really that strong to begin with. My latke party of fall 2013 (remember Thanksgivukkah!?) wavered somewhere between success and failure. It was a success because I have very nice friends and acquaintances, all of whom were happy pretending that they were full from two latkes, that they didn’t mind sharing plates, and that it was "an adventure" eating oily potato pancakes in a sweltering New York apartment. It was a failure in that I spent pretty much the whole night hovering over the stove and hugged everyone goodbye smelling of canola oil and sweat. I learned a few things from this latke party. Everyone loves latkes, and they will absolutely trek out to your apartment (a 20-minute walk from the closest subway), even in the freezing cold, just for the promise of crispy potato pancakes. No matter how poorly you plan or execute said party, your guests will be happy. There are easier ways to make latkes for a crowd than bending over the stove, flipping them to order. In my experience, there are two keys to making great latkes: Balance your ingredients and thoroughly rid your potato mixture of as much moisture as possible. Besides those two tenets, potato panacakes are incredibly easy to put together—in fact, you don’t even need a recipe. Feel free to play with the classic potato-onion-matzo trifecta: Swap in sweet potatoes for regular spuds, add chives or other alliums to the mixture, or sub panko for matzo meal. But what about the issue of frying for a crowd? Kim Severson pan-fries her latkes and then freezes them, in a single layer, on a plastic wrapped baking sheet. When the hungry crowd arrives, she bakes them in a 425° F oven for 15 to 20 minutes, until hot and crispy. Bon Appétit (and Selma Brown Morrow, the Latke Lady) reminds us that if pre-cooking the latkes, only fry them until they are lightly brown but not cooked all the way through. She finishes them in a 400° F oven, flipping once, until crisp and bronzed. Max Falkowitz, on Serious Eats, recommends starting off your latke party with a fresh crudité platter, because there’s nothing like radishes and carrot sticks to prime your stomach for some starchy, greasy deliciousness. He also recommends serving latkes alongside a simple tossed salad, which you can prep ahead of time and toss right as guests—and latkes—arrive. Unlike the previous experts, he advocates frying latkes to order—and tapping guests to help ease the burden in the kitchen. This strategy has the advantage of making your friends feel special and needed, but it also keeps you from fully enjoying the party. I would only recommend following this avenue if you have invited over a small group of guests who you know very well and who don’t mind getting their hands a little starchy. I recommend setting out a fix-in's station, buffet-style, so that your guests can jazz up their pancakes to their own whims. As to what toppings you include, that's up to you. It wouldn’t be a latke party without the traditional applesauce and sour cream, of course. 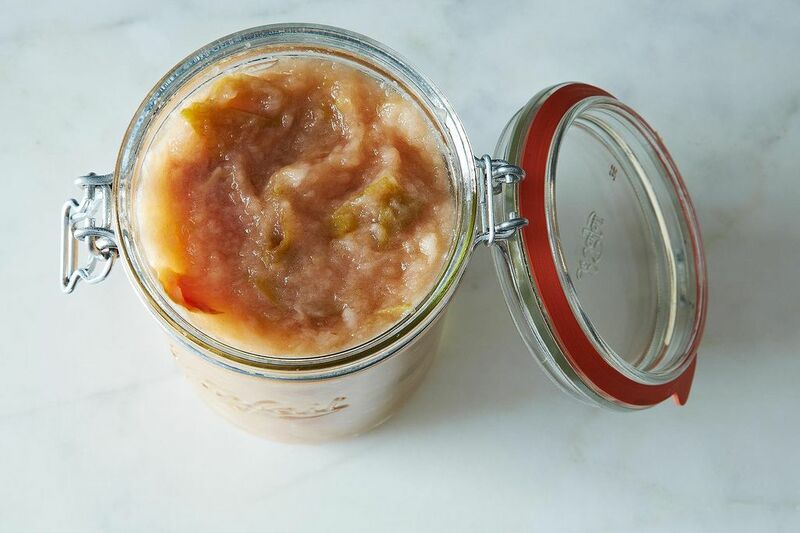 For extra points, make your own applesauce: It's a snap, and a great way to use up sub-par apples. However, Morrow (the aforementioned Latke Lady) recommends deviating from the classic applesauce and sour cream, at least for a few latkes: She likes to top a few pancakes with crème fraîche and caviar, drizzle some with gravy, and save at least a few to dunk, piping-hot, in sugar. And in Melissa Clark's family, they serve latkes with lox and herring. When it comes to cocktails, serve booze that will cut the richness of the latkes: The fizzling bubbles of beer or prosecco fit the bill. I recommend assigning a few friends to bring each one, but don’t forget to buy at least one bottle for yourself. When you're done pre-frying your latkes, you will definitely need it. Traditionally, sufganiyot (fried, jelly-filled donuts) are served as a post-latke treat. But I find that the last thing I want to eat after fried potatoes is fried dough. If that’s your jam (or, in this case, jelly), by all means—I salute you. 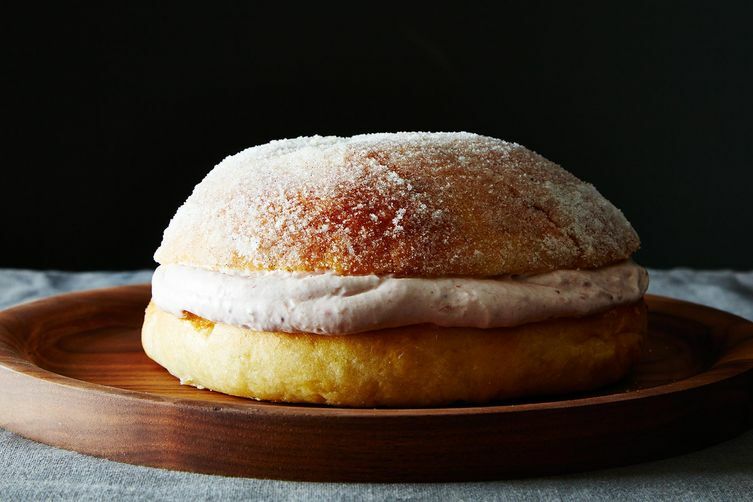 If you do want a lighter way to sate your sweet tooth, I suggest Sarah's Sufganiyot Cake. You can bring it out to your sated, potato-stuffed guests like, "What, this thing I just had lying around?" Because that's how you make a lasting impression. 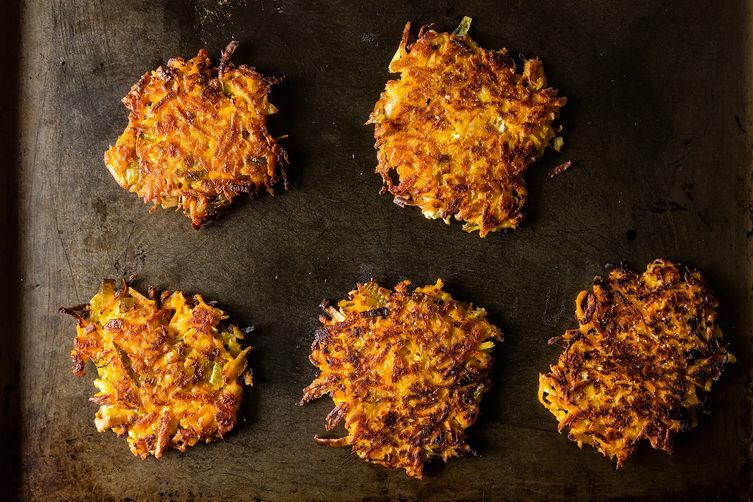 Have you ever thrown a latke party? Do you have any tips for making potato pancakes for a crowd? Tell us in the comments! After one year of being stuck in the kitchen we decided to use a convection "hot plate" on the table. Now the latkes are made to order at the table. This year we are going with the family recipe but there are going to be a few bowls of add ins, like jalapeno slices and some pumpkins. I have discovered that you don't need matzo meal. I fry latkes every year for my friend who has celiac disease and just leave it out. The latkes are even more delicate and delicious, and hold together fine. I also recommend that you make the batter in smaller batches if you're making a huge amount since it gets too liquidy. I'm originally from Israel and we serve our levivot (latkes) on the more savory side. I usually do a little toppings bar with creme fraiche and smoked salmon (like Melissa) a chopped Israeli salad of cucumber tomato and onion (like the others, served on top of the latke - nicely cuts the richness) and my favorite: horseradish-spiked sour cream with shredded short ribs. Makes it a real meal! Sorry to be a grammar/language troll. Well, not really sorry. I believe you meant fixins, evolution of a southern slang term, not fix-in's, which is incorrect in both meaning and grammar. Bah!!! Where is your editor? Hiring someone to cook and/or clean is the best luxury ever. You can consider asking friends to bring drinks or toppings and use the $$ you save for hired help. I now fry outside on the patio for ease of (read: NO FLOOR) clean up. It beats covering the kitchen floor in towels. I use disposable plates, utensils and even serving trays. I also borrow additional electric fryers so we can really churn them out! My favorite latke is sweet potato topped with a dollop of sour cream, some cheap caviar from a big box store, and chopped chives. This year I am extending the party hours, calling it an 'open house,' hoping some people will come with kids after school, others after work and then some in the later evening. Slowing down the flow of folks will hopefully make it easier to keep up with the frying! I make & freeze all kinds of latke variations. After the first year, though, I realized that the most important ingredient, at least for our party of about 50-60 people, is to hire a couple of high school students to keep the latkes warming and served by someone who isn't me! I make them with friends days and even weeks in advance. We have latke making cooking dates and we've been doing it for years. We have fun making a mess together, alternate houses each year. I've got 50 in my freezer now and after this afternoon's latke making session with two friends I'll have double that. My Hanukah parties are never stressful or greasy since all I have to do is take these beauties from freezer to oven. And if I have any leftovers I'll top then with some smoked salmon, creme fraiche and chives for an elegant hors d'oevres for a holiday party. You can never ever have enough latkes in your freezer! I use a blend of russet and Yukon Gold potatoes, coarsely shredded. If you shred them in the processor, alternate potatoes with onion to avoid darkening. Squeeze dry with a tea towel; switch to the steel blade in the processor and return some of the shreds to the processor to mince them fine, then stir all together. Add the rest of the ingredients. Using all Yukon Gold, however, I sometimes pre-form them on sheets of wax paper or parchment; use a 1/4 to 1/3 c. measure to form neat discs. If using all Yukon Golds (I haven't tried this with the russet-Yukon blend), they can be frozen in the raw without discoloration in a plastic container or ziplock bag!! I'm definitely in the make ahead camp - flipping latkes during the party, or making a friend share the misery, not fun. Once frozen (fully cooked) on baking sheets, they can be stacked in freezer containers or bags to minimize freezer real estate. Then just have a couple of baking sheets ready, spread them out and rotate into the oven as needed - they heat/crisp quickly, no need to defrost. For toppings, I agree you have to have applesauce/sour cream. Also, any smoked fish - salmon and trout, especially - and some sour cream/creme fraiche. I've also folded diced roasted beets, horseradish and dill into sour cream to dollop on top - crazy pink and very tasty. Great tips! Thanks! 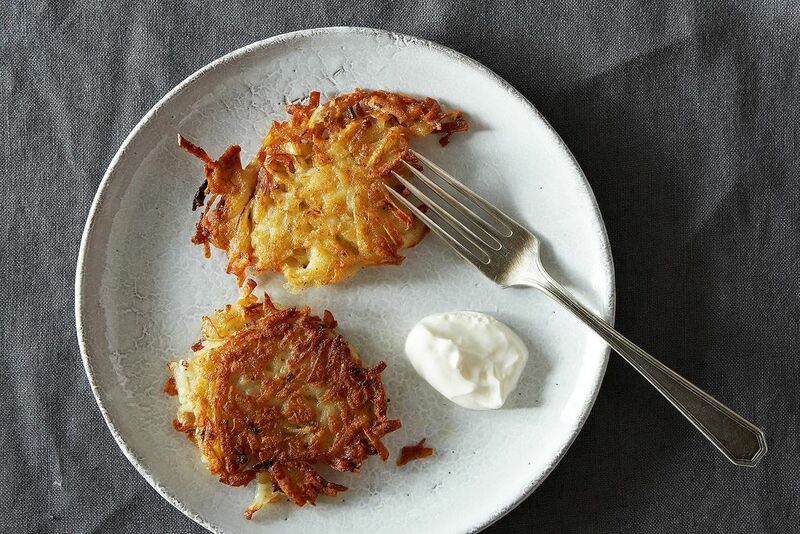 We have a latke party every year, and try a new recipe every time. Sagegreen's recipe on this site is terrific. We also have used recipes with dill, parsnips, carrots, and a little onion added. Adding some pears to the applesauce is a great variation as well, or making baked apples. One of our favorite meals.